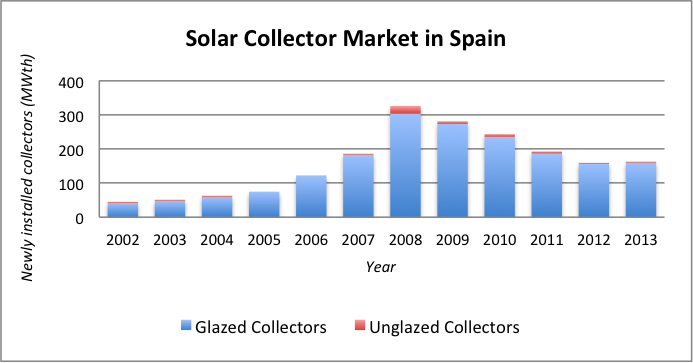 Solar thermal systems in Spain consist mainly of water-based flat plate collectors. According to 2012 data a total capacity of 2074 MWth (2962824 m2) was installed. The former capacity corresponds mainly to flat plate collectors (1862.9 MWth, 2661260 m2) with a little share of unglazed (93.9 MWth, 134191 m2) collectors and evacuated tube collectors (117.2 MWth, 167373 m2). During 2014 a capacity of 178.5 MWth (255000 m2) was added to the overall system, representing a 9.7% increase with respect to 2013 figures. The share for the newly added capacity corresponds to flat plate collectors and prefabricated systems (92%), unglazed (6%) and evacuated tube collectors (6%). The current primary application is for domestic hot water, with a share of more than 85% of the total installed capacity in 2012 (25% single family houses, 55% multiple family houses, 5% tourism sector and 3% in the public sector). Solar combi-systems are also present (4% for single family houses and 5% for multiple family houses). Finally, applications on solar cooling, solar district heating systems and solar heat for industrial processes cover the smallest part of the new installations. Since 2006, the Spanish Technical Building Code imposes the coverage of a portion of DHW in every building. This code is to be revised to include other forms of renewable heat and the inclusion of district heating and cooling networks. In the Spanish Renewable Plan until 2020 it is also considered to develop some public incentives to the commercialisation of renewable heat. A recent regional program for solar heat in Andalucía has produced an increase of the market during 2014 close to 9%. It is estimated that the solar thermal industry in Spain comprises nearly 100 companies of different sizes. Nearly 40% of them are manufacturers. For the most common solar thermal applications the typical marketing is two-tiered: from manufacturers to installers and from installers to end-users. Data coming from ASIT-Solar estimates direct employmet in the sector close to 5,000 people. Solar technologies in buildings are considered in the Spanish Technical Building Code in two different ways. For every new building a demand limitation is imposed through simulation taking into account passive solar issues. In a second stage, the energy footprint is calculated, where active solar systems are directly involved in the simulation. The Spanish Technical Building Code imposes a minimum DHW contribution from 2006 and it will be revised in the upcoming years to include district heating and cooling system characteristics. The Spanish Renewable Plan until 2020 will establish economic support for renewable heat, which includes solar thermal. The aim of this plan is to multiply by ten the energy coming from solar thermal in 2020 with respect to the 2005 values. A specific R&D programme for solar buildings does not exist. Instead there are different programmes within a global scheme that have R&D on solar thermal and solar buildings included into their main objectives. The most important programmes are included on the National Scientific Research, Development and Technological Innovation Plan (National R&D&I plan). The Work Programme is prepared every year, so the main objectives regarding solar thermal are highly sensitive to variations on the current Science and Technology policy. This plan is currently implemented by the Competiveness and Economy Ministry, and can be found at www.idi.mineco.gob.es under the “Plan Estatal de Investigación Científica y Técnica y de Innovación” section. Solar thermal use in Spain varies greatly and includes almost every type of system. In the 2005 – 2011 period promotion of solar cooling was done through demonstration projects. At present the principal innovation is being introduced in the large systems area. Recently it has been approved, under the National Scientific Research, Development and Technological Innovation Plan (National R&D&I plan), a large R&D Project on Smart Cities, taking into account mains topics on solar thermal and solar buildings. This cooperative project gathers public and private entities, such as research centres and large companies, around the objective of developing systems that cut cities' energy demand to a high extent, new systems of distributed micro and mini-generation with embedded renewable energies, and holistic control innovative systems (business intelligent). These R&D activities will be developed and implemented in a pilot district to show technical and economic viability of this kind of initiative and to act as a demonstration project. The main strategic plan regarding solar thermal is performed by the Institute for Energy Savings and Diversification (Instituto para la Diversificación y el Ahorro de la Energía, IDAE). It is included in the National renewable plan (actually developed until 2020 and called “Plan de Energías Renovables 2011-2020”). The most important support measure for solar buildings comes from the Spanish Building Technical Code. Building energy labelling will be mandatory starting the 1st of June of 2013 for all buildings to be sold or rented. The national solar thermal association is called ASIT (www.asit-solar.com), which stands for Solar Thermal Industry Association. Green Building Council Spain (www.gbce.es) is the most prominent association regarding solar buildings in Spain. There are many websites regarding renewables and solar thermal in particular, mostly private initiatives. CIEMAT holds its own renewable energy portal, where information for solar thermal can be found. Era Solar (www.erasolar.es) is the most popular specialized magazine devoted to disseminating news in the sector.